Despite an early Arctic blast that's brought freezing temperatures to all 50 US states, many golfers aren't about to put their clubs away for the season. In fact, with a weekend warm-up projected for many parts of the country, the coming week... even here in New England... will likely feature golf for those of us who refuse to relinquish the game just yet. As far as apparel for those wintry rounds, It always seems to me that the most innovative and exciting cold weather golf styles come from Japan. Have a look at the 2014 Fall//Winter campaigns for companies like Pearly Gates, Kappa Golf, Black & White, Callaway Japan and Viva Heart ... to name just a few... and you'll see what I mean. Unfortunately, these Japanese collections are generally not available here in the US, and that tends to leave me quite frustrated as temperatures descend. That's why I'm rather ecstatic about Uniqlo. Now that the Japanese LifeWear designer has established a firm foothold in the US, we finally have access to apparel that features the technologically advanced textiles, marvelous design and extraordinary range of colors that are the hallmarks of Japan's golf clothing lines. Though not specifically a golf apparel company, Uniqlo offers numerous golf-perfect pieces in its LifeWear collection, and the awesome Adam Scott is a Uniqlo brand ambassador. Much to my delight the company just opened a store here in Danbury so naturally I've already selected numerous items for the frosty fairways we'll be playing on for the next several months. I'll definitely be wearing Uniqlo at next week's Thanksgiving shotgun. 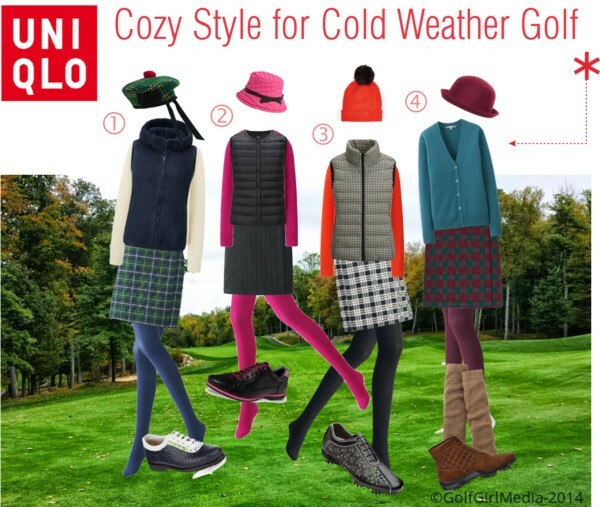 In the meantime, for ladies contemplating a cold weather round, I've styled several sublime winter golf outfits around Uniqlo pieces that are sure to keep you warm in style. Uniqlo makes men's clothes too... we'll feature them in a future post.